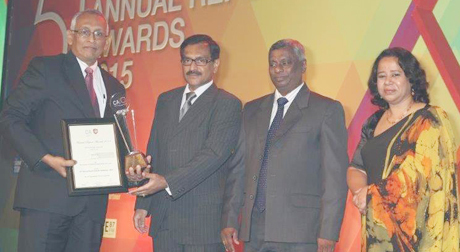 Alumex won the Manufacturing Companies Gold medal at the 51st Annual Report Awards Ceremony 2015 hosted by the Institute of Chartered Accountants of Sri Lanka (CA Sri Lanka). Managing Director, Alumex PLC, Rohan Peris (far left) receives the award from officials of the Institute of Chartered Accountants of Sri Lanka. The selection criteria was based on the Sri Lanka Financial Reporting Standards, corporate governance, transparency and disclosure. Managing Director, Alumex PLC, Rohan Peris said, "This is a very important accolade for Alumex PLC and is indeed a recognition of its efforts to continue commitment to transparency. Alumex PLC, being one of the leading companies in Sri Lanka that manufactures quality, innovative aluminium profiles for window and door systems, believes it's the company's responsibility to establish a benchmark for financial reporting." "The Award is a clear reflection of Alumex PLC effectively communicating financial and non-financial information to stakeholders and adhering to legislative needs and accepted accounting best practices. In evaluating reports for the awards, CA Sri Lanka looks at the organisation's ability to effectively communicate organisational objectives, highlights, performance, personnel and management to an intended audience. We are appreciative to all partners and stakeholders for helping us win this prestigious award," he said. CA Sri Lanka Annual Reports awards are held to reward the most cohesive, clear and customised annual reports that best reflect an entity's operations and encourages excellence in the presentations of information covering transparency, social accountability and good governance among diverse Sri Lankan business entities. President, CA Sri Lanka, Arjuna Herath said the institute as a professional body, and the legislated promulgator of accounting and auditing standards in the country, has taken every step over the years to enhance the financial landscape in the country. Alumex PLC which manufactures aluminum extrusions for an extensive range of applications such as fabrication of doors, windows, shop fronts, curtain walls and other specialised commercial applications, has a reputation for operational excellence, work ethics and high standards of product quality and on-time delivery, a company spokesman said.